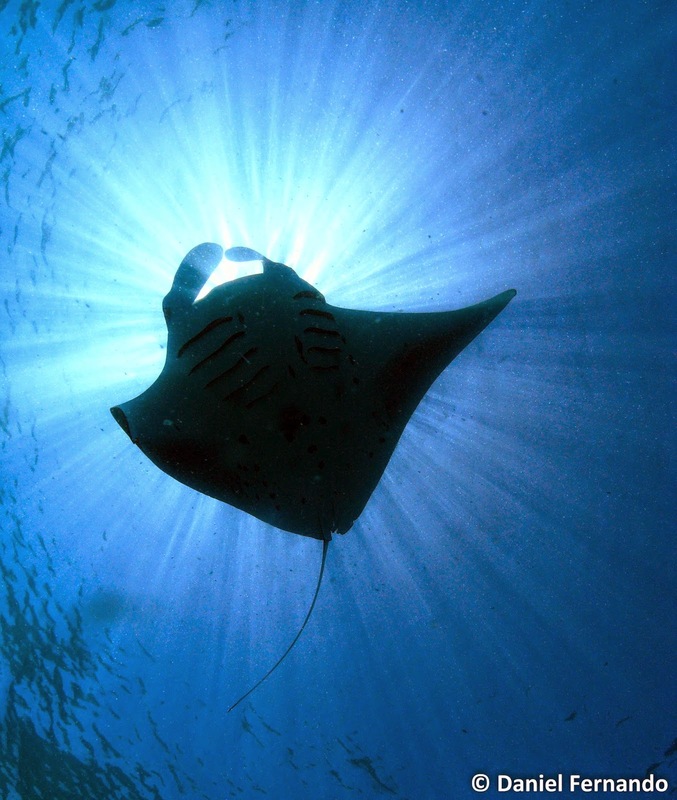 The Manta Trust has received funds from MCAF to support manta ray research around the world. Its scientists recently asked the Aquarium community to help name two recently tagged rays. Thanks to everyone who submitted names! A winner will be announced Tuesday, Sept. 16, 2014. 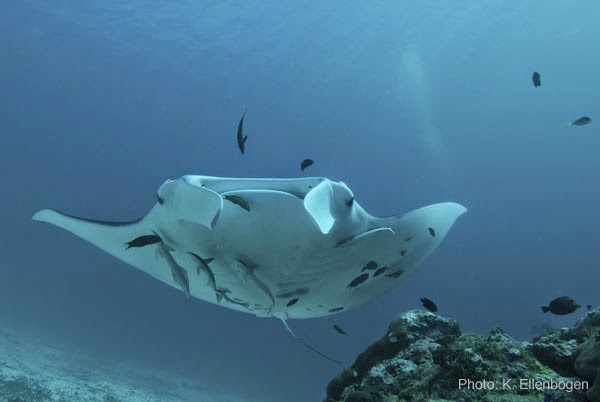 In this post, guest blogger is Daniel Fernando of the Manta Trust explains his focus of research: documenting the mobulid rays landed in three Sri Lankan fishing communities. Read Part 1 of this series. My work focuses on the fisheries surveys in Sri Lanka, and thanks to a generous grant from the Aquarium's Marine Conservation Action Fund (MCAF), I was able to carry out intensive field surveys at three primary landing sites. The most interesting and largest of these three survey sites is Negombo, where both manta and mobula rays (collectively called “mobulids”) are landed as bycatch from the skipjack tuna gillnet fishery. The survey begins with a 3 a.m. wake-up, followed by an hour’s drive to the market. At this time the market is already bustling with fishermen unloading their catches, auctioneers shouting their prices and buyers scurrying around with their purchases—all of this accompanied by the smell of fresh and rotting fish. Due to the lack of refrigeration on boats and any proper preservation techniques, much of the landed fish is already spoilt. On the positive side, nothing goes to waste—all the rotten fish, along with guts and other discarded remains are dried and sold as animal fodder or cheap dried fish. 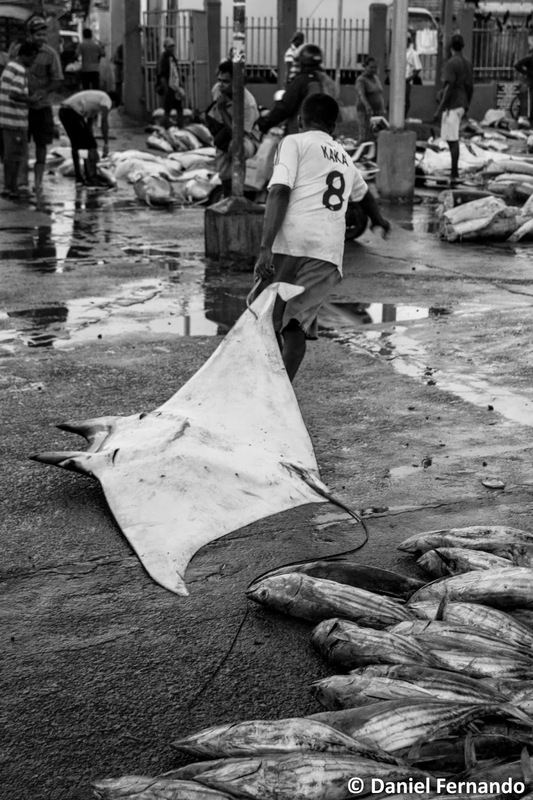 The Aquarium’s Marine Conservation Action Fund helped scientist, Daniel Fernando document the impact of the manta and mobula ray fishery by collecting data at markets, such as this one in Sri Lanka. While ensuring that I do not get hit by a shark or ray chucked off a boat, I collect as much data as possible. I begin by logging all the mobulid species landed, their gender, maturity and collect tissue samples from vital species such as mantas. Other information such as sale prices, current demand and fishing locations is also logged since it all helps obtain a better understanding of the entire fishery. Some of this data has already helped influence international policy decisions for better control and management of the trade of manta gill plates. But this is just one market in one country and my work is not restricted to Sri Lanka. In fact I am conducting another project, funded by the Save our Seas Foundation, to create a global mobulid identification guide. This project was initiated due to ambiguity in identifying the extremely similar looking mobula species, one of the main reasons behind their inadequate protection. One component of this guide also includes a genetic kit, for which tissue samples are required from all corners of the world. Global collaboration on such a project is an absolute necessity, and MCAF’s support of other mobulid projects, around the world is critical as it not only expands data collection but also enables projects such as mine to obtain samples from all regions of the world in order to create an international, robust genetic identification kit. This kit, once produced, will be available to researchers in the field expanding mobulid data collection, and to international trade officials working to ensure the implementation of regulatory bodies such as CITES. I hope that this initiative, along with the long-term fishery surveys, will provide us with the data and means necessary to ensure the survivability of these vulnerable species for generations to come! Daniel Fernando is Associate Director at the Manta Trust, a PhD student at Linnaeus University and a grantee of the Aquarium’s Marine Conservation Action Fund. He lectured at the Aquarium during the 2013 Aquarium Lecture Series. Watch his talk on the Aquarium's YouTube channel.